The story begins with Nito's Tale, about a service dog in training from Assistance Dogs of the West. In Nito Meets Chloe, Nito is matched with a little girl in a wheelchair he lives with and helps every day. They love each other and do great work together. 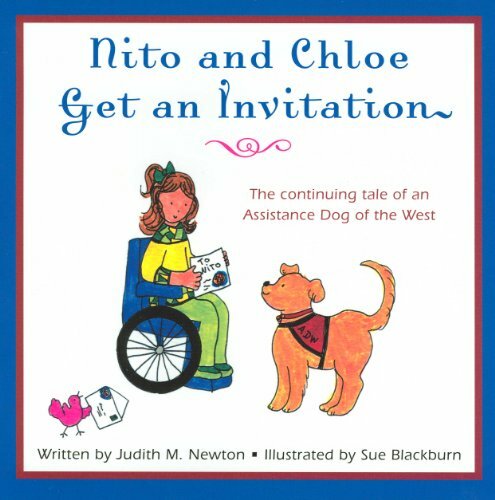 In Nito and Chloe Get an Invitation, they are invited to Washington to visit the White House, meet the President, his family, and their dog Bo and receive the Service Dog of the Year award. Celebrate the honor with them! The author, Judith Newton, served as Executive Director of the Special Education School in Paris, France and was Director of Youth and Adult Programs for the Montgomery County, Maryland, Association for Retarded Citizens. While working at the Children's Foundation in Washington, DC she advocated for children's food programs at congressional, state and local levels. Her volunteer work includes 15 years as a docent at the National Gallery of Art. Moving to Santa Fe seven years ago, she became a docent at both the Georgia O'Keeffe and New Mexico Museum of Art. Having always wanted to write a book for young children, inspiration came from her board involvement with Assistance Dogs of the West. And from sweet Chutney, who always wags her tail. The illustrator, Sue Blackburn, started drawing and coloring after 25 years of being 'grown-up'. During her grown-up period, she graduated from Richmond Professional Institute with a degree in Art Education and earned her Master's Degree in Elementary Education from the University of New Mexico. Sue taught elementary grades for 14 years in Virginia, New Mexico and Guatemala. She and her family are dedicated travelers, and while living in Hawaii she started doing her 'kidscapes.' They were an instant success and she has since sold her bright, happy drawings to people from all parts of the world. Especially popular are her colorful Mexican drawings, kid-infested banyan trees of Hawaii, and the winsome pueblo children of New Mexico. Sue does over 100 family portraits every year, designs posters, magnets and Christmas ornaments. She has illustrated several books.